Amy is a Certified Personal Trainer in North Phoenix AZ, Cave Creek AZ through the American Council on Exercise and is studied in Exercise Physiology and Kinesiology. Amy is also a former pro endurance cyclist and world record holder, with 20 years of commitment to a personal training career, helping others achieve and maintain their health and wellness goals. Whether it is weight loss, injury rehab, or to improve sports performance, Amy is dedicated to helping her clients commit to fitness, and achieve it for life. She works with all ages and fitness levels. Workouts can be in-home, outdoor, or held in her private studio in Cave Creek with no special equipment required . Amy offers private (one-one), or in small groups up to 4. 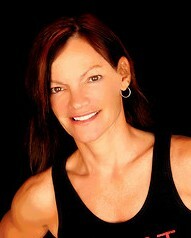 Amy emphasis includes putting her clients on the road towards life-long health and fitness. This begins by determining what works best for each client based on lifestyle, body-type, goals, and most importantly, incorporating activities they might enjoy that contribute to strength and fitness, such as hiking, biking, Pilates, yoga and strength training. Challenge – and enjoyment, is the key to rapid and permanent results. It can be done! Amy offers something for everyone, regardless of lifestyle, budget, or fitness level. Workouts can be held in the client’s home, in the studio, outdoors, or a combination of all three. Learn more about Personal Training with Amy. Submit your name, e-mail, address, city and any comments/ questions you might have.